Kin H. of the UK. Kin ordered 3 of the 1 Meg recycled PCMCIA S-Ram Cards from Best. "Just wanted to say thank you for the prompt delivery of my order. These cards are great!" N. Gabriel of Romania Gabriel purchased 2 of Best recycled 1 MB PCMCIA cards for use with the Atari Portfolio (with adapter card) and his NC-100 Laptop. "Also good news, I've just formatted the two cards on my NC-100 and they are fine :) The price and the service is unbeatable! Well, now I have to search a Portfolio PCMCIA adapter. Thank you and best regards!" PORTFOLIO CHESS GAME CARD The Portfolio Chess Card has a World PC Chess Tournament Program with Ten Challenging Levels from Novice to Master! Atari Portfolio Chess Game features: F2 Help feature which allows you to see further help pages on individual Program features, Chess Clocks showing the amount of thinking time that each player has used so far in the game, will display the last 4 moves made by each side, If it is your turn to move and you are not sure which move to make-the Hint feature will analyze a move which it considers to be satisfactory for you, built in Demo mode and Sound On/Off feature. Chess card with 14 page Users Manual. HPC-750 $54.95 Last One! Atari Portfolio Ram Card Tech Tip: Remember that all Atari made Portfolio Ram Cards (32K, 64K and 128K) have an internal very thin lithium CR2016 coin battery (they can be accessed / removed on one end of Portfolio Ram Card that hangs outside of the Portfolio case, the internal small crescent shaped black plastic coin battery holder, sometimes have a very very small sliding locking tab on the end of the Portfolio ram card edge to lock the battery holder into the ram card) to keep voltage on the Portfolio Ram chips when the card is not inserted into the Atari Portfolio PDA. These lithium coin batteries are have a fixed life cycle (typical 1 to 3+ years of use / Portfolio Ram storage time, depending if the Portfolio ram card is left in a running / power up Portfolio all of them time or stored outside of the Portfolio) when used in an Atari Portfolio Ram Card. Never replace the old Coin battery inside the Portfolio Ram Card when the Portfolio Ram card is NOT inserted into a power up Portfolio PDA or other powered up device that uses these Portfolio Ram cards. There is a very good chance you will loose all of the stored Portfolio data on that Portfolio ram card if you don't. Only replace the old dying Portfolio Ram Card battery when you have it fully inserted into a running / power up Portfolio or other device that uses these battery backed up ram cards and make sure you can access any Portfolio data stored on that Ram card 1st. This way the running Portfolio or other power up device will supply voltage to the inserted Portfolio Ram card, to keep the Portfolio ram chips voltage up, while you changing out the old dying 2016 battery. Also another good Atari Portfolio Tech Tip: A good idea after inserting in a new fresh Portfolio CR2016 lithium coin battery into a Portfolio Ram Card (using the replacement new battery technique above) is to double check the exact voltage (with a VOM meter) left on the CR2016 Coin battery about 6 months to a year later after you have changed out Portfolio Ram card batteries. This will give you a rough idea when you should do the next Portfolio Ram Card new battery swap out. You should not let your Portfolio Ram Card batteries drop below 2.50 volts, below this amount of volts you will start to loose memory storage / data on your stored Atari Portfolio Ram cards. 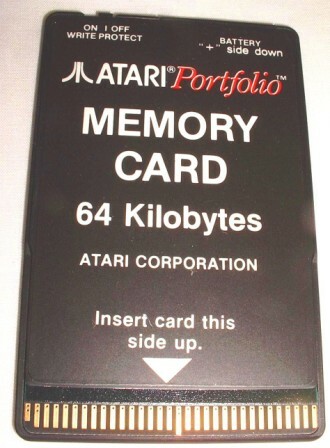 Use the small Portfolio labels that are provided with each new Atari Portfolio Ram Card to mark the date you installed a new CR2016 Colin battery and the next date when a new fresh CR2016 Coin battery should be installed in your Portfolio Ram Card and apply this small label to the Portfolio Ram Card. Portfolio 1 MEG one time Programmable Eprom card. 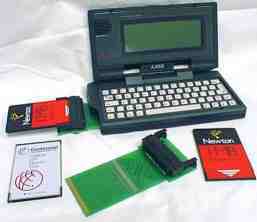 If you have developed an Atari Portfolio Game / Program / Application for the Portfolio, you can burn that Portfolio application to a 1 meg Atari Portfolio one time program 1 Meg Bee card and it is saved for ever with no coin type of back up battery ever required to retain the Portfolio data on the Atari 1 Meg Bee card after it is programmed up. 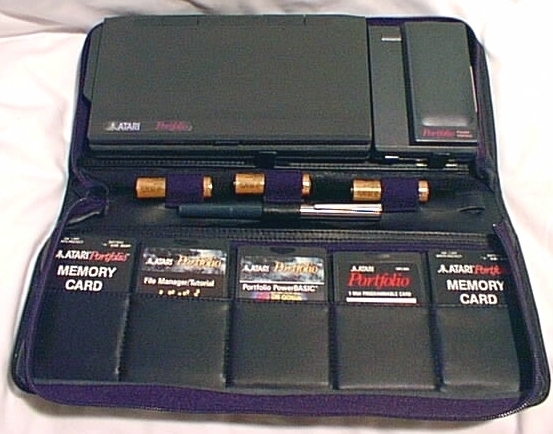 From there all you need is a Portfolio card label, manual and box an you are in the Atari Portfolio software business. Required above Atari made 1 Meg EPROM Burner Adapter Board and a 1 meg Eprom burner. HPC-205 $29.95 Qty discounts available for Portfolio software developers. Portfolio Upgrade Manual This Upgrade Manual was written in Germany by Stefan Kachele and translated into English by W. Holl. This upgrade manual has three Different hardware upgrades for the Atari Portfolio! 1. Three different Internal memory upgrades (With schematics) 224K, 320K or 512K of Internal Ram. 2. Increasing the Clock speed of the Portfolio from 4.9MHz to 6.5MHz, up to 33% faster performance. 3. Increasing the low battery warning time from 10 -15 minutes to change the batteries to 48+ hours before the batteries are drained and the data is lost. It may be necessary to install a second internal reset switch if you require a complete Portfolio cold reboot in the future once this Upgrade is done. 4. Using the Portfolio parallel port with PBASIC as an I/O Interface. These upgrades should only be attempted by an Experienced Electronic Technician with a good background in SMT type practical experience!! CB102428 $27.00 Contact us for Our recommended Qualified Atari SMT Technicians!